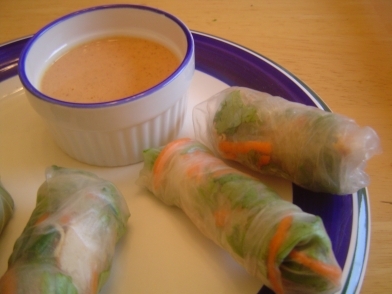 The other night I made summer rolls for dinner. I don’t go to that much trouble to make them, because they’d take even longer than they already do, and from the minute I cut and squeeze the first lime, as soon as I take the cilantro out of the fridge, I’m impatient to eat them. Maybe that’s the key—I should make the first one, eat it, and then go back to making the rest after I’ve taken the edge off that hunger. Already I’ve stopped julienne-cutting the carrots and gone to shredding them instead. I’m not as painstaking as I used to be. I remember the moment when I changed my tune about the carrots, when I mentally weighed the crunch of matchsticks in the roll versus getting them done ten minutes faster. It was a hungry day. And I never went back to the julienne. I know that in the coming months I’ll talk a blue streak about my mother, my grandmother, and myself in the kitchen—what I kept and what I discarded, what I do that they never did. I miss being able to tell my mother what I made for dinner, and I miss hearing her tell me what she’s put on polenta lately, a chunky stew or scrambled eggs with scallions. It took a long time to appreciate that they’d learned where to cut corners and where to take pains (cooking onions, on the barest heat, for hours until they practically melted). It took even longer to give myself permission to make those decisions for myself. When the rice paper tears, no matter how careful I’ve been, I fling it into the sink to get it out of my way and start again, breathing deeply near the lime-scented cilantro. I am not the neatest summer roll wrapper in the world, but once you eat them, it doesn’t really matter that it took forty minutes to wrap them all and that the carrots taste sweet but don’t crunch. It doesn’t matter that I had only half the soy sauce I needed and so the cashew dip is missing a little something. It matters that the rolls hold together during the dipping process, and that you moan a little while you’re eating them, and that’s about all. One last spoken word clip—this one from Chris Tse. Someday, when I find one of good quality, I’ll post one of the last speaker, who was also amazing. Saturday we went to the annual Westfest, a free festival that takes place in Ottawa’s Westboro neighborhood. It’s either our bad luck or our great luck that it happens the weekend of our anniversary every year. I mean, we could definitely go somewhere else that weekend, but then my husband would miss out on volunteering at Chess-in-the-Street, and honestly, we can go away anytime. It’s a tradition now. Chess-in-the-Street is just what it sounds like—tables full of chessboards and two gigantic chessboards out in the crush of people—one with pieces about a foot tall, and another with pieces closer to two feet high. It’s compelling to see kids step out of their sugar-charged racing and sit down, chins on fists, plunking pieces with precision, their faces painted with butterflies or stained with snow cone flavoring. It’s a nice break for the parents, too, I think. And of course, chess players have a strong interest in keeping future generations interested in the game. So when the coordinator asks for volunteers, Myron signs his name. During that time, I poke around at the kiosks and walk down to the far end of the festival, where the stage is set up. In the afternoon, there are literary readings and spoken word performances. Sometimes I’m less than impressed, but this year’s speakers were a perfect storm of charisma and phenomenal writing. The books were sold out by the time I got back to the sales table with cash (TD Bank, you are too far away), but I’ll be tracking down books by Sheila James and Daniel Allan Cox, for sure. And Rita Donovan read some pages from a forthcoming novel that is going to knock me out. And then there was the spoken word segment. I usually end up leaving after this starts, but this year I was riveted until the very end. All four performers were amazing—young, with the best kind of healthy arrogance, the kind you need when you’re speaking your words out loud, in time, in rhythm, sure that your words are right, knowing that somewhere in the swirl of space between you on the stage and your audience, truth is happening. It’s creating itself out of nothing. The worst part was being there by myself because, as soon as the show was over, I immediately wanted to talk over every work with someone else who’d been as moved as I was. Now that’s success. I’ll share video from these performers this week. This is from Hyfidelik.